Beauty...Peace...Privacy...Luxury... - a few of the words that will come to mind as you step into Ombak Luwung. In creating this absolute beachfront villa, we sought to combine simplicity with the exotic artistic embellishments characteristic of Balinese design. As you enter the villa, the vistas unfold, one after another, until you finally face the deep blue Indian Ocean and the hypnotic rhythm of the surf. We promise that you will be enchanted. 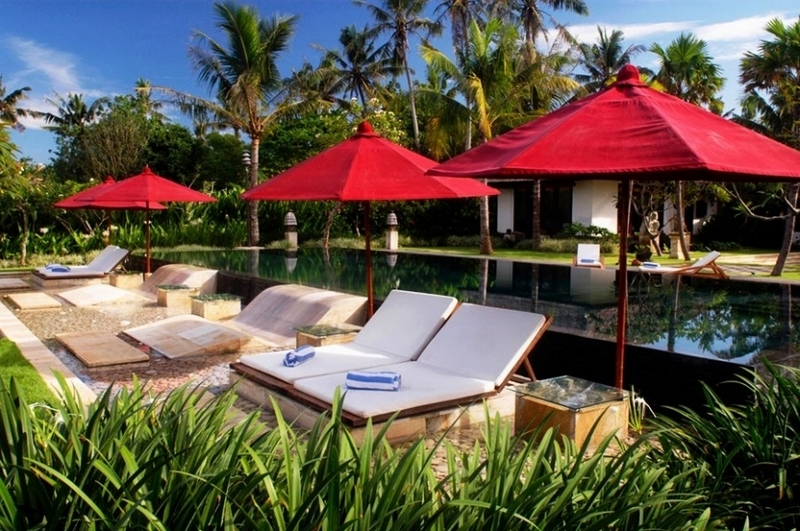 Ombak Luwung is set on an acre of beachfront land in the quiet fishing village of Canggu. Designed by internationally-renowned and award-winning architect/designer, Bill Bensley, and top Balinese architect, Popo Danes, the estate is composed of five ensuite bedrooms, a living pavilion, dining pavilion, and massage pavilion. Lush gardens, an infinity pool, heated jacuzzi, and endless sea views are also at your doorstep. A visit to Ombak Luwung will combine the luxury of a world-class resort with the relaxation afforded by absolute privacy. While there is an infinite range of activities and experience awaiting you beyond the walls of Ombak Luwung, you may find, like many of our guests, that you simply do not wish to leave. We look forward to sharing this piece of paradise with you - we know it will be an experience you will never forget.